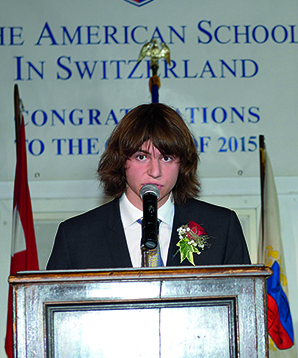 Class of 2015 Valedictorian Anton Alyakin (Russia) is now working on a double major in Computer Engineering and Neuroscience at Johns Hopkins University, where he has made the Dean’s List each semester and worked as a summer researcher in the Neuroengineering Lab. Anton took a combination of AP and IB classes and exams while at TASIS, earning a perfect 5 on AP Calculus AB, AP Calculus BC, AP Statistics, AP Photography, and AP Physics and an excellent 6 on IB Math HL, IB Chemistry HL, and IB Biology HL. He was honored at graduation with the Shah Akbar Khan Award for Excellence in Mathematics. Anton credits all his teachers for pushing him to be his best, but he singled out two in particular who had a profound effect on his academic career. Anton, who played for the Varsity Soccer, Badminton, and Lacrosse teams and was a member of the Yearbook Club, made the most of his time at TASIS and amassed a countless number of indelible memories.